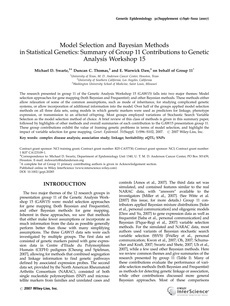 The research presented in group 11 of the Genetic Analysis Workshop 15 (GAW15) falls into two major themes: Model selection approaches for gene mapping (both Bayesian and Frequentist); and other Bayesian methods. These methods either allow relaxation of some of the common assumptions, such as mode of inheritance, for studying complicated genetic systems, or allow incorporation of additional information into the model. Over half of the groups applied model selection methods on all three data sets, using models in which genetic markers were used as predictors for linkage, phenotype expression, or transmission to an affected offspring. Most groups employed variations of Stochastic Search Variable Selection as the model selection method of choice. A brief review of this class of methods is given in this summary paper, followed by highlights of other methods and overall summaries of each contribution to the GAW15 presentation group 11. These group contributions exhibit the value of framing genetic problems in terms of model selection, and highlight the impact of variable selection for gene mapping.